An oven that is overheating, getting too hot, or is burning your food, is a common fault on electric ovens. In most cases the problem is simply a faulty oven thermostat failing to regulate the temperature in your oven correctly. Of course, a faulty thermostat is not the only possilble fault which can cause an oven to overheat; for more information See our 'oven overheating guide'. Oven thermostats are unsophisticated simple electro mechanical switches designed to regulate the temperature in the oven cavity based on the temperature setting, which is adjusted using the control knob. The thermostat controls the power to the heating element by turning it on and off to maintain the desired temperature inside the oven. Due to the cycling nature of this heating system the temperature will always be fluctuating as the element is switched on and off. 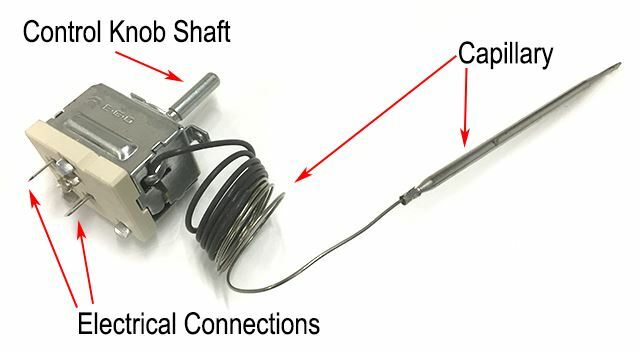 As well as the electrical connectors on the thermostat body there will also be a capillary tube with a solid bulbous end Fig 1. This end will extend down in to the cavity of the oven so that it is in direct contact with the heat when the oven is on. The capillary is filled with gas which expands and contracts when temperature inside the oven changes. This moves the bellows inside the thermostat body causing the electrical contacts to open and close, turning the oven element on and off as mentioned above. Because the gas inside the capillary is essential to the correct functioning of the thermostat it is very important that care is taken when fitting a replacement in order to avoid bending or breaking the capillary. This would render the thermostat unserviceable as the pressure build up required to move the bellows would be inhibited. Hi, I’m Lee from Ransom Spares. If your cooker is overheating, or your control know is spinning round with no resistance then it is likely to be the cooker thermostat on your cooker that needs replacing. In this video I’m going to show you how to fit the oven thermostat in to a built in single electric oven. Firstly I’m going to remove the door for ease of access. To do this we need to remove the two clips on the hinges. When we close the door the hinges won’t close on themselves but instead they will come away from the hinge housing. Now we need to unclip the oven thermostat temperature sensor. We can now remove the oven back panel and lid panel in order to gain access to the rear of the ovens control panel where the thermostat is located. Next we can remove the oven know and remove the screws that are holding the oven thermostat in place. Now we must make a note of the wiring that is going to the oven thermostat before removing. We should now be able to remove the oven thermostat and capillary from the inside of the oven and replace it with the new one.